Mudra is a Sanskrit word for gesture, symbol, or expression. A Mudra in yoga is usually made by the positioning of our fingers and thumb. This creates certain neuronal connections, to impact the flow of subtle energies and balance out the elements within us. Mudras are also used in Indian classical dances to represent and project particular moods, attitudes and feelings. 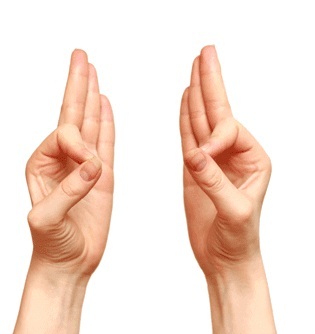 Hasta Mudra (hand gestures/hand yoga) is meant to ensure that health “remains in our hands” ! Minute pressure on the pulse centres of different parts of our hands, triggering multiple healing processes within the body part associated with it. 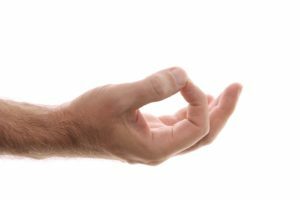 The Hasta Mudra channelizes pranic energy in a way that the waves of the ocean generate tidal energy or a short circuit that is used to boost electrical impulses. Nadis and chakras radiate Pranic energy. Mudras help the practitioner to redirect energy within and also create barriers to prevent the escape of prana. Hasta Mudras stimulate the brain stem and influence unconscious reflexes to tap the potential of our mind, body, and prana. The human hand has as many as 100,000 nerves. Each fingertip has 3,000 nerve receptors. Each part of the hand is linked to different parts of the brain. When we apply pressure through Hasta Mudras, pressure points are activated. 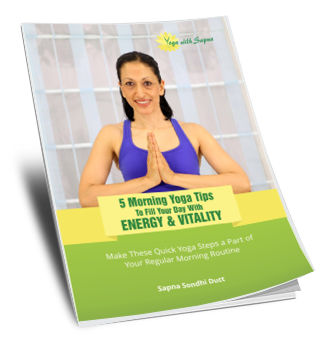 This leads to changes in brain patterns and unleashes the dynamic potential of the body-mind-energy circuit. 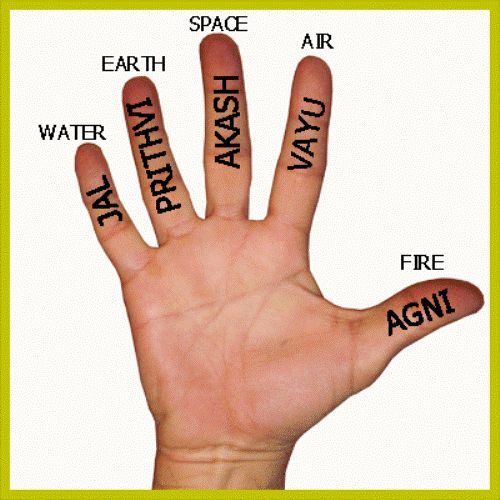 Some fundamental Mudras are discussed below. This is the Mudra of wisdom and knowledge. The individual consciousness (microcosm or Atman) is represented by the first finger, while the thumb symbolizes higher consciousness (macrocosm/Brahman). The ultimate goal of a practitioner, the union of the self with the cosmic supreme being, is embodied in this mudra. Touch the tip of the thumb to the index or first finger only. The other three fingers should be straight. 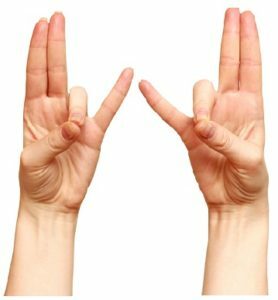 There are two ways to perform this Mudra- active and passive. In the passive version, the tips of the thumb and index finger touch together. In the active variation, the index finger is folded under the thumb such that the fingernail is on the second joint of the thumb. For better results, it is advisable to do the Prana Mudra after doing the Gyan Mudra. 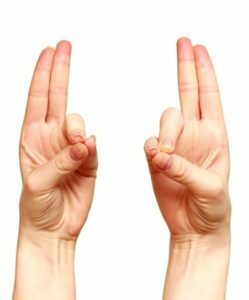 This is one of the most common mudras used in meditation. It is exactly like the Gyan Mudra except that the palms are facing upwards. 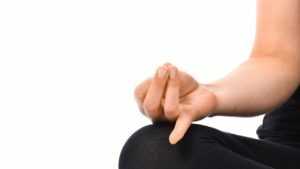 Chin Mudra clears the mind and calms the senses. It also promotes concentration and eases mental tension. It can be used to cure insomnia, high blood pressure, and depression. Touch the tip of your index finger to the thumb. The other three fingers can be kept straight or relaxed. They can even be bent. 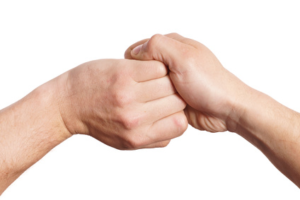 The index finger and the thumb only need to touch each other without exerting any pressure. Hands should then be placed on the thighs, facing upwards. Index and middle finger are turned down towards the palm. The thumb is used for closing the right nostril and the last two fingers are used for closing off the left nostril (this is for people who are right handed. For left handed persons it would be the opposite). Less movement is needed to close each side during pranayama. This balances the water element in the body. It also prevents diseases due to lack of water. It has no specific time duration and can be practised as per your convenience. But those with asthma or respiratory disease should do this mudra only for a short while. The tip of the little finger should touch the tip of the thumb. 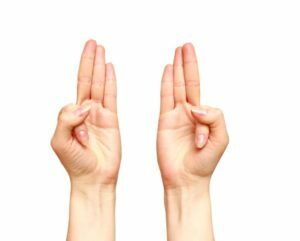 The other three fingers should be stretched out straight. This Mudra is excellent for activating the thyroid gland. It should be practiced twice in a day for 5-15 minutes. Touch the tip of the ring finger to the base of the thumb. Now exert pressure on the finger with the thumb. 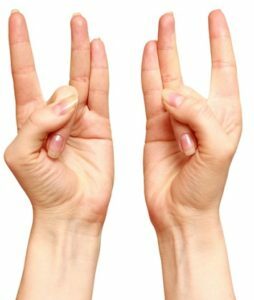 This Mudra can be practiced for 20-30 minutes daily. It is perfect for increasing heat in the body. Raise your intake of milk, water, fruit and fruit juices as well as clarified butter if performing this Hasta Mudra regularly. 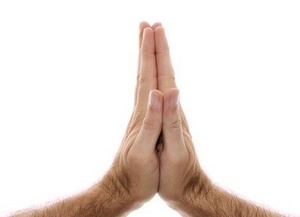 Interlock the fingers of both the hands together. Put a little pressure on the left thumb. This hand posture is commonly used during the opening and closing practice of yoga and other postures as well. 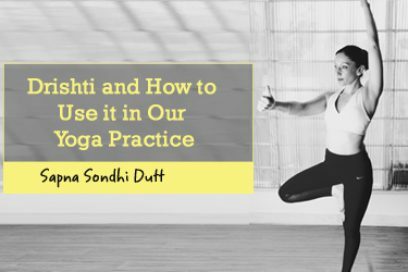 Anjali, in Sanskrit means, “to offer” or “to salute”, and the term mudra means “seal”. This mudra is also famously known as the Aakash-vardhak mudra. The Aakash mudra increases the Aakash element (space) within the body. Ensure that the tip of the middle finger touches the top of the thumb and the remaining fingers are kept at ease, but straight. The middle and ring fingers are joined to the thumb. The index is placed at the base of the thumb. The little finger is kept straight. Clasp the hands in front of your chest and apply pressure as you pull on both hands outwards. Clasp fingers inside the palm and press the index fingers together. Hold at the level of the abdomen and point the fingers downwards and the thumbs in towards you. Kali represents purification and transformation. 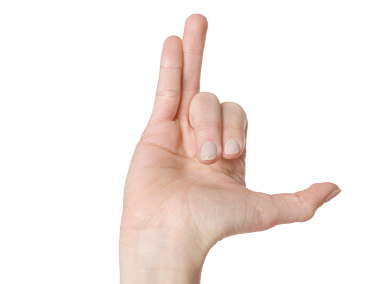 Through the practice of this Mudra, air-related diseases like Sciatica and Gout are eliminated. The thumb comes over the finger exerting a slight pressure on the finger. 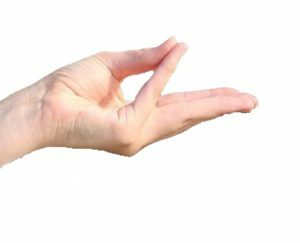 Use this Mudra to regain bodily stability and combat obesity and body weakness. The tips of the thumb and the ring finger touch each other. Tip of the middle finger is placed at the base of the thumb. The thumb comes over the finger, exerting slight pressure. The other three fingers are kept straight. The tips of the thumb, ring finger and little finger touch each other. The other two fingers are kept straight. Sense the energy rising upwards. 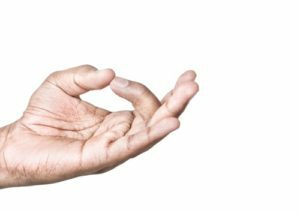 Mudras are a subtle but powerful practice. Utilize this ancient wisdom and choose mudras which address your physical concerns and do them regularly for a length of time with concentration and faith and then assess if they are benefitting you. Good luck with your practice, as you stay on your yogic path. The Sage of Kanchi, Maha Periyav (Shankarachaarya) used to show a Mudra in his right hand as follows:- Thumb and the first 3 fingers will be joined; the little finger will be separated, leaving a gap. What kind of Mudra is this? And the Purpose?